You are here : Home / Posts Tagged "bioprinted microarray"
Prof Laura Lechuga, Scientific Director of NANBIOSIS U4 Biodeposition and Biodetection Unit is coauthor of an article publish by ACS Sonsors that shows a portable and autonomous device based on optical interferometry that, when used with specialized nanoplasmonic, can detect directly bacterial cells of the patient’s blood plasma. 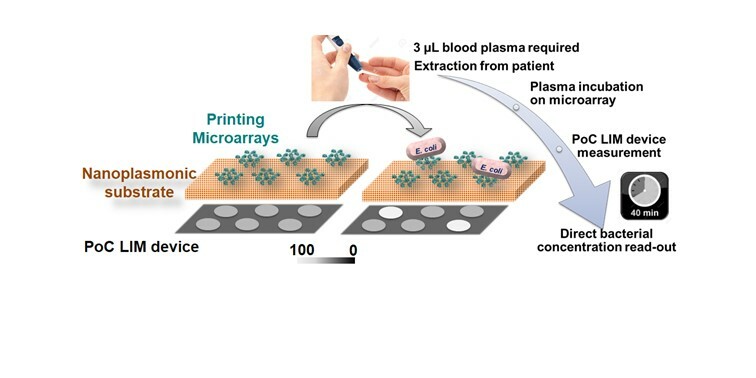 The work demonstrates the potential of a microarray based POC device for bacteria quantification. The contribution of NANBIOSIS, in particular Unit 4, has been fundamental by providing the molecular printers necessary for the generation of the biofunctionalized specific microarrayed chips used for the bacteria detection.